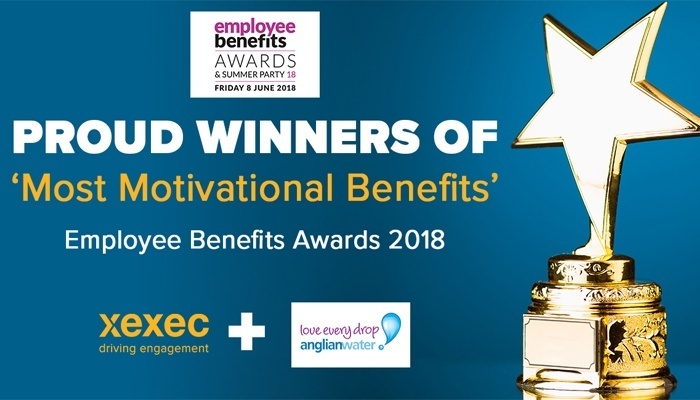 Anglian Water’s Going the Extra Mile (GEM) Reward and Recognition programme has won the Most Motivational Benefits Award at the 2018 Employee Benefits Awards at The Pavilion at The Tower of London on Friday 8 June 2018. This award celebrates the most effective motivation or incentive strategy implemented by an employer. Anglian Water worked with Xexec to develop their formal employee recognition programme, GEM, targeted at its entire workforce to reinforce positive behaviors within the organisation and help encourage behavioral change amongst its customers. GEM was introduced to make it quick and easy to recognise great work, simplify the processing required and generate higher levels of engagement within the organisation. Since launch, there has been a huge increase in levels of engagement including over 8,000 employee nominations, more than 300 teams nominated and over 60% of its employees receiving an award. Some of the awards include personalized thank you cards, cash awards, cash awards, charitable donations, travel awards, experience days as well as vouchers. Anglian Water recognized the impact that an employee’s wellbeing can have on how they contribute to the organisation. If you’d like to find out more about Xexec and how their reward and recognition programmes can impact your organisation, get in touch.